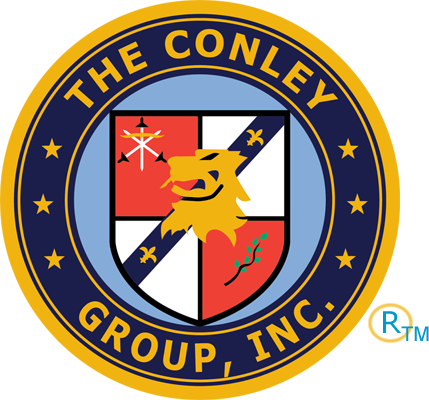 The Conley Group, Inc.’s corporate seal is comprised of a circular design with a golden border that circumscribes the seal. Our name appears in golden letters, encircled in a dark blue band that is flanked by two thin golden circular bands, and separated by three golden five-point stars on each side of the seal. Another smaller band of dark blue appears outside each of the two thin golden lines. The crest is located within the outer seal which is surrounded by three medium blue sections and is located within the circular dark blue band. The seal’s meaning begins with the center crest which contains crossed swords that characterize strength, the head of a Lion rampant guardant representing courage and preparedness to act at any time, and an olive branch that embodies both the offering of peace and the victory over evil. The fleurs-de-lis located in the sloped blue band signify perfection, light, and life. The three golden five-point stars on each side of the seal denotes the triad comprised of our organization, our customers and our public safety partners. Every component of the triad represented by each of the three golden five-point stars is essential for operational success. The seal and crest, separately and in their entirely, are the sole intellectual property of The Conley Group, Inc. and have existing Service Marks registered to The Conley Group, Inc. by the State of Iowa.